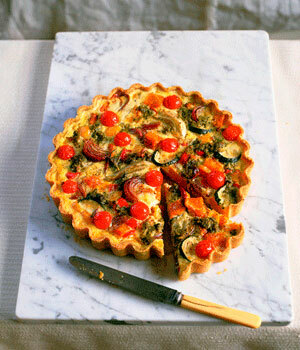 This roasted vegetable and pesto tart is so colourful, it is sure to be the talk of the table! It’s quick and easy to make in 1 hour 5 mins for £1.25 per serving. 1. Preheat the oven to 200°C/Gas6. Lightly grease a baking tray. 2. Place the onions, tomatoes, peppers and courgette on the tray and drizzle with olive oil. Roast for 15-20 mins. Remove from oven and cool. 3. Roll out the pastry on a lightly floured surface and use to line a 23cm loose-based tart tin. Trim off any excess. Line with greaseproof paper, fill with baking beans and bake blind for 15 mins. Remove beans and paper and bake for a further 5 mins. Remove from the oven and allow to cool. Reduce oven to 180°C/Gas 4. 4. Spread the pesto on to the base of the pastry. Top with the roasted vegetables, pour over the beaten egg and pop back in the oven for 12-15 mins.